Visual LIT is a collaboration between the ASU Library and the ASU Art Museum that brings together visual artists interested in exploring different aspects of the library — from antique books to future modes of communication. The four participating artists are Fiamma Montezemolo, Euan Macdonald, Zhou Tao and Faivovich & Goldberg. 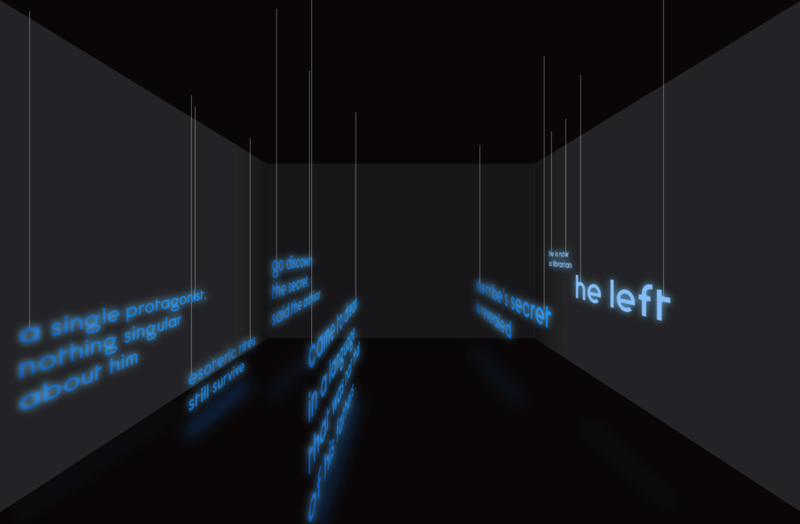 “Neon Afterwords” is an immersive installation, in which seven sentences, written in fluorescent LED blue light tubes, float at different heights in the dark space of a room. The sentences are extracted from Borges' short story "The Anthropologist" (1969). In an adjacent room, three books containing the mentioned story are exhibited with the key LED sentences redacted with a blue tape. The story is therefore disseminated in different spaces. Thanks to her double training as artist and anthropologist, Montezemolo reflects more on the central moment of an anthropologist's formation: the fieldwork. This piece carries an additional reference to the use of neon light in the typical space of artistic Italian research in the Post-War era, from the famous neon arabesque by Lucio Fontana for the Triennale of 1951 to Mario Merz's Igloo. The piece “Neon Afterwords” was originally produced by the Italian Cultural Institute of San Francisco in the cycle Mapping the City, curated by Marina Pugliese. “Rastros/Traces” is an experimental video essay based on the border life between the United States and Mexico. Shot in a span of 24 hours, the video examines the border wall that separates Tijuana and San Diego. Images of a rusty wall, unruly topography, decaying surveillance structures, furtive moments of undocumented migrant crossings and dystopian landscapes are interwoven with a mournful voice-over enunciated from a different time and place. In recent times, libraries have been conscientiously building collections that respond to the changing needs and demands of their communities. Visual LIT attempts to continue this trajectory with a new focus on what is traditionally known in the library as a pathfinder — someone who gathers information in a specific location or area of study within a library. Artists will adopt this role and creatively help guide specific research topics, or, in art terms, site-specific research, to the location of the library. By bringing installation in video, sculpture and sound, they will conceive new experiences for library-goers that allow interconnectivity between the written word and the visual language. This exhibition is supported by the Italian Cultural Institute of San Francisco and Mapping the City. A unique class that challenges students to think and act globally has taken root at Barrett, The Honors College at Arizona State University's Downtown Phoenix campus. The Global Engagement Lab allows honors students to engage with global issues in their local community by working with non-profit, community-service organizations. Over the last two years, the four worked together to think through and create the GEL, a project born from the realization that there were few academically focused, globally engaged community service opportunities for honors students. O’Flaherty and her team focused on trying to find something that revolved around engagement and had a unique honors spin to it, and that could lend a measurably broader and deeper experience to honors students. They spent many hours vetting documents, thinking through which organizations to partner with, and creating the course they envisioned. “Given the economic, social and cultural divisions that characterize life in the 21st century we feel that honors education must engage directly in the community and support students’ exploration of life’s complexity,” O’Flaherty said. “We noted that much has been written on service learning and the value of volunteerism to college students but little systematically examines the role of community engagement in student development and advancement. Virtually nothing has been written that focuses specifically on high-achieving students or honors students and the value of learning while embedded in the community,” she added. In 2016, they finalized plans for the GEL and chose as a partner the International Rescue Committee (IRC), a global humanitarian aid, relief and development nongovernmental organization based in Phoenix. The IRC offers emergency aid and long-term assistance to refugees and those displaced by war, persecution or natural disaster. The organization currently is working in more than 40 countries and 22 U.S. cities, including Phoenix, where it resettles refugees and helps them become self-sufficient. O’Flaherty taught HON 394, The Global Engagement Lab (GEL) I, in fall 2016 with 12 students. She is teaching GEL II in the spring 2017 semester. Through the GEL Barrett students are working closely with IRC staff to create real, tangible solutions to complex challenges. O’Flaherty said that the GEL allows honors students with diverse backgrounds, experiences, and majors to work together on projects. “The Lab offers students the opportunity to work with community partners over a sustained period of time to develop in-depth understanding of potential solutions to challenges faced by the organizations,” she said, adding that students also have the opportunity to put the critical thinking skills they acquire in Barrett’s signature course, The Human Event, into action. Early in the course, the GEL mainly focuses on discussion about the organization and presentations from IRC staff to enhance students’ understanding of relevant issues. Clear expectations are established to make sure student teams meet organizational needs and that students benefit from the experience. Throughout the course, students go to the IRC’s offices and facilities to assist the organization. “This is neither just a volunteer opportunity nor a service-learning project. The GEL is grounded in an academically rigorous environment that builds on and enhances skills. It uses human-centered design to provide students the opportunity to create, innovate and serve. We believe the Global Engagement Lab has the potential to be a centerpiece of Barrett education,” O’Flaherty said. O’Flaherty said IRC staff has expressed concern about federal funding due to the current political climate in which support for refugees and refugee organizations is dwindling, and are therefore looking into private grants. GEL students, who have strong research skills, are assisting the IRC in finding and applying for funding. In addition to grant research, students engage in client interviews, observation, short- and long-term project management and volunteerism. All student work is done under the guidance of Barrett Honors College faculty who provide extensive contextual training to make sure that student teams are aware of the social, political, economic and cultural complexities in which they are working. “The Lab brings faculty, staff, students, community partners and community members together and provides tangible ways for us to learn from one another and facilitate each other’s progress. 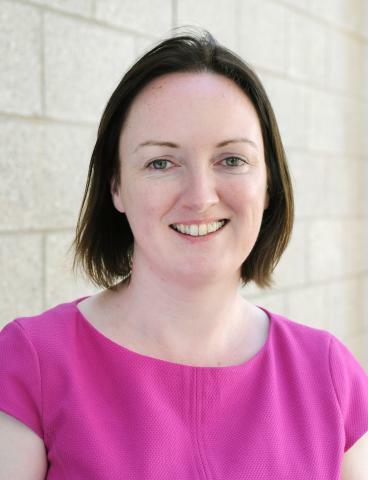 As leaders in the 21st century it will be imperative that our students can see connections at the macro and micro level and consider local issues from a global perspective,” O’Flaherty said. The GEL also has implications for students’ futures in the world of work, she said. Lerman Montoya, a GEL student and journalism major, said the class has opened his eyes to current issues and provided a forum to address them. Tooms, who was a freshman when she began helping develop the GEL, will enter her senior year in August. It has been gratifying to see the GEL in action, providing opportunities for students to build leadership and social skills, as well as work with a community partner, she said. Students in the Global Engagement Lab, in conjunction with the IRC, are hosting an event titled "From Harm to Home: A Community Discussion on Refugee Resettlement in Arizona" at 6 p.m. Friday, April 7 at Roosevelt Community Church, 924 N. 1st Ave. in Phoenix. A panel of presenters, including IRS staff members, recently resettled refugees, and local refugee business owners, will speak about their experiences. IRC staff also will discuss the organization’s refugee settlement work. Panelists will take questions from the audience. This event, which is free and open to the public, also will feature children’s activities. More information is at http://tinyurl.com/FromHarmToHome.